Are you attracting the customers you actually want? We all know that running a business can be tough. First you need to find customers and when you have them, you need to keep them coming back. When it comes to marketing, both to new and existing customers the natural tendency is to tell the world about your products and services. Want to know why that’s a bad strategy? Do read on…. Caught your interest? Never has this been more the case than with the plethora of digital tools out there. You could spend every hour in the day sending and reading interesting tweets, gawping at amazing photos on Instagram or watching video after video on YouTube. As a business that helps its clients spend their valuable time and money in the right places we always advise starting with one thing – creation of customer personas. In this article I’ll give you some tips on how you can begin the process of creating your own. The main digital purpose of these personas is ensure that your content is targeted. Everything you do in terms of your marketing and communications should be aimed at these personas. It will help you focus your efforts in both time and budget. First you need to define how many personas you’re going to have. In my business there are only two. Remember these are my ideal customers. Start small and add more later if you need to. Step 1). Make your profiles as real as possible, as they’ll be easier to remember. Give them names, a photo, an age and location. Now we need to give them a back story. Step 2). The backstory doesn’t need to be long, just a couple of paragraphs. Describe the person. Who they are, what makes them tick. Do they have children, hobbies etc. Step 3). Lets research some aligned brands now. Tools like Facebook Insights will help you to fill this out. Step 4). Where do these people ‘hang out’ online – We now need to use sites like ComScore to see where this demographic like to spend time online and what devices they might be using. This helps us create content for the right devices as well as giving us ideas for sites we might like to build relationships with. Step 5). Their Pains – Probably one of the most important areas. You need to consider the challenges and questions that this group is asking itself and which your business can answer. Use tools like www.answerthepublic.com for ideas and write them down. Then…you guessed it…. Step 6). Answer the questions above. Create responses which you can develop into things like keyword strategies for search engines, social media content, videos, infographics and articles for your blog. And thats really it. No more than a page or two of A4 or it will be unwieldy and difficult to get buy into internally. Once you’ve done this I guarantee you’ll make better use of your time and budgets online. p.s. 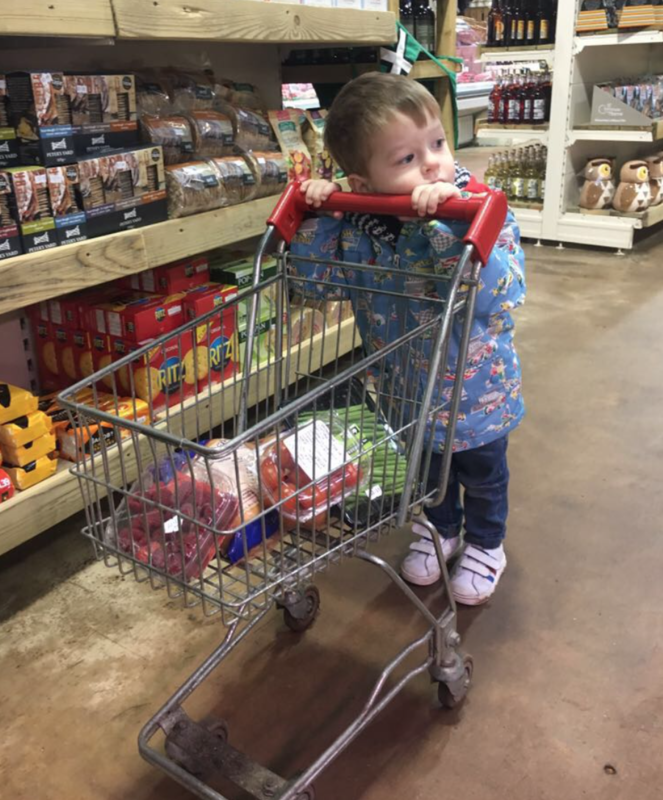 If you’re wondering about the picture – its my 3 year old son Oscar with his own Trolley at a local farm shop. These guys obviously know their personas very well! Every weekend, Oscar tells us where he wants to go shopping. Simple and very effective.